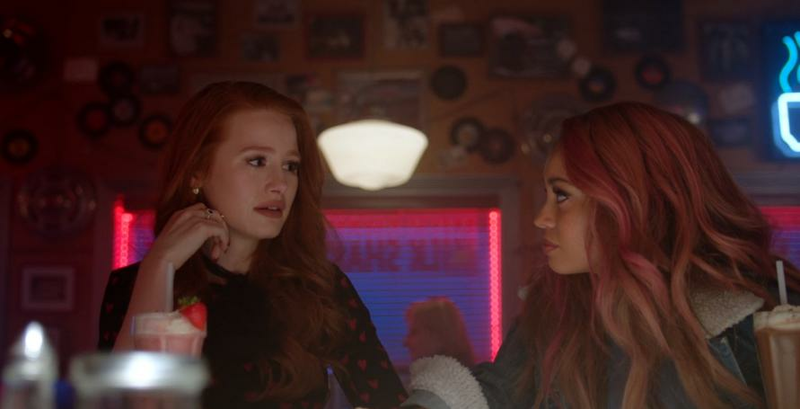 Everyone Is Shipping Cheryl And Toni After This ONE Scene In "Riverdale"
Cheryl and Toni are officially ON. Cheryl Blossom has officially come out as bisexual on Riverdale and it's the moment fans have been waiting for. Last week, Madeleine Petsch took to her personal YouTube channel to confirm that Cheryl was "interested in both men and women" and now fans have a fuller picture of what Cheryl has been experiencing with regards to her sexuality. After revealing a painful childhood memory regarding a judgmental Penelope Blossom, a certain Southside Serpent assured Cheryl that she was "sensational". Of course, Toni Topaz (who has been confirmed as bi since early in the season) was the perfect confidant for an emotional Cheryl. She was so perfect, in fact, that fans are now prepared to board this newly established ship. They're pretty much the duo that Riverdale fans NEED. Pioneers in their field. Truly. Just gimme the good stuff. The lady doth protest...not that much. cheryl: get your sapphic serpent hands OFF my body!!! Aaaand Lili ships too so just set all phasers to Choni.